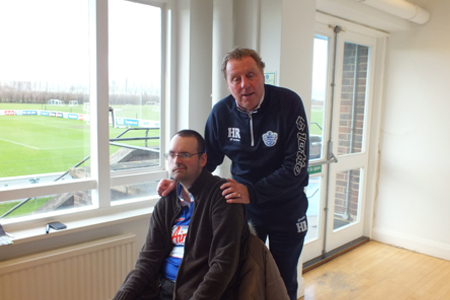 Thank you, thank you, thank you for my QPR experience. It has made my year already. Although it doesnt look like it in the photos ( ive lost my smile) , i was beaming inside and was shaking when i got to meet the players. My mum was telling me to ‘calm down’. It was fantastic to meet my heroes. They all came over and signed my calender for me, shook my hand and had photos taken with me. I was getting totally overwhelmed by the time i went home. The next day was match day. It was brilliant but very cold. As well as my mum i took Steph from J’s Hospice, my sister, brother in law and my niece (it was her first football match). During the match i got a hug from ‘Jude’ the club mascot. 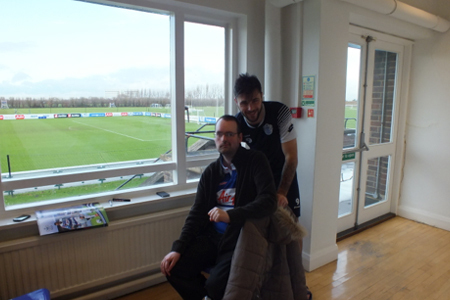 We went on and won 2-1 with my favourite player Charlie Austin scoring both for us. When my mum told me about going after she was told, i could have cried. It has always been my dream to go to the training ground and meet them. You have done that for me and i am so so so thankful for this. I have such happy memories from this.